At a choice of a kind and type of the heating device consider appointment, an architectural lay-out and features of a thermal mode of a premise, a place and duration of stay of people, a kind of system of heating, tehnikoekonomicheskie and sanitary-and-hygienic indicators of the device. 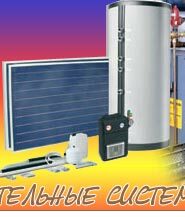 For creation of a favorable thermal mode choose the devices providing uniform heating of premises. 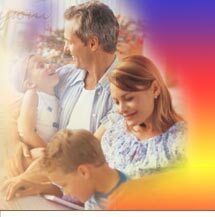 Metal heating devices establish mainly under light apertures, and under windows the length of the device is desirable not less than 50-75% of length of an aperture, under show-windows and stained-glass windows devices have on all their length. At placing of devices under windows (fig. 39 vertical axes of the device and a window aperture should coincide (it are supposed a deviation no more than 50 mm). the Devices located at external protections , promote rise in temperature of an internal surface in the bottom part of an external wall and a window that reduces radiating cooling of people. The ascending streams of warm air created by devices, interfere (if there are no the window sills blocking devices) to hit of cooled air in a working zone (fig. 40). In southern areas with short warm winter, and also at short-term stay of people heating devices is admissible to establish at internal walls of premises (fig. 39. The number of struts and extent of heat conductors is thus reduced and the heat transfer of devices (approximately on 7-9%) raises, but there is adverse for health of people a movement of air with the lowered temperature at a premise floor (fig. 35). Vertical heating devices establish probably more close to a floor of premises. At considerable lifting of the device over level of a floor air at a floor surface can overcool, as circulating streams of heated up air, becoming isolated at level of placing of the device, do not grasp and do not warm up in this case the bottom part of a premise. The more low and more long the heating device (fig. 41, the more exactly premise temperature and is better gets warm all volume of air. The high and short device (fig. 416) causes active lifting of a stream of warm air that leads to overheating of the top zone of a premise and lowering of cooled air on both parties of such device in a working zone. 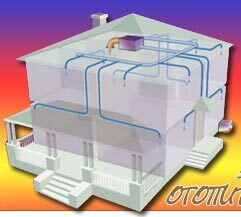 Ability of the high heating device to cause an active ascending stream warm air can be used for heating of premises of the increased height. Vertical metal devices , as a rule, place openly with a wall. However their installation under window sills, in wall niches, with a special protection and dressing is possible. On fig. 42 some receptions of installation of heating devices in premises are shown. Device shelter the decorative case, having two crack in height to 100 mm (fig. 42, reduces a device heat transfer by 12% in comparison with its open installation at a blank wall. For transfer to a premise of the set thermal stream the area of a heating surface of such device should be increased by 12%. Device placing in a deep open niche (fig. 42) or one over another in two circles (fig. 42) reduces a heat transfer by 5%. It is possible, however, the latent installation of devices at which the heat transfer does not change (fig. 42) or even increases by 10% (fig. 42). In these cases it is not required to increase the area of a heating surface of the device or even it is possible to reduce it.